5. 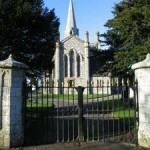 Church of Ireland church – Evidence of three different churches can be found on the site at Lorum. The nineteenth-century seven-bay church stands on elevated ground in a striking setting about 3.5 km from the River Barrow. 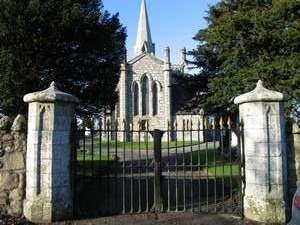 It was built about 1838 to the design of Frederick Darley who also designed the gate piers which reflect the detailing of the church. The fine, west tower with spire was added in 1862 along with a vestry. It is built of granite ashlar and has well-detailed Gothic revival windows. The interior retains its stone pulpit, wall monuments, stained glass windows, gallery and later timber-sheeted coved ceiling. Closeby are the remains of an eighteenth-century church while to the south and east of this building are the barely discernible traces of a much earlier church. 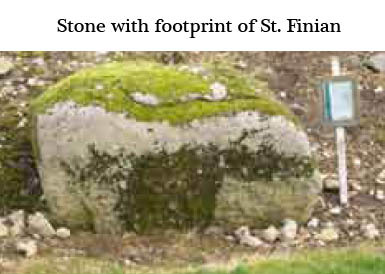 There was a monastic settlement in the area associated with St. Laserian to whom a nearby well is dedicated (see St. Laserian’s Trail). 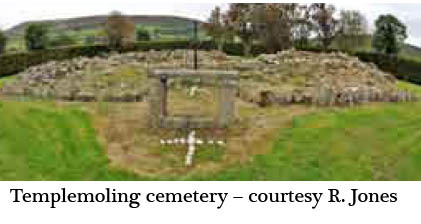 Early nineteenth- century sources record the presence of a ‘steeple’ at this site which may indicate the former presence of a round tower. The base of a high cross lies a few paces south of the eighteenth century building.